Geneva, 18 January 2018 – Today, the AMR Industry Alliance launches its first report that shows the commitment of the life sciences industry to tackle the public health threat of antimicrobial resistance (AMR). The Alliance brings together over 100 biotech, diagnostics, generics and research-based biopharmaceutical companies and trade associations from 20 countries. The report was compiled by the consultancy SustainAbility. The data and case studies collected in the Alliance report provide unique insights into the practical steps members are taking to respond to AMR in the areas of research and science, access, appropriate use, and the environment. The report presents data on AMR-relevant products, including therapeutic agents or technologies that have the potential to treat or prevent infectious diseases and/or combat resistance, including but not limited to antibiotics, vaccines, diagnostics, and novel approaches to address AMR. The Alliance showcases industry’s efforts and commitment to fulfil its role as a necessary and constructive partner in finding sustainable solutions to tackle AMR. 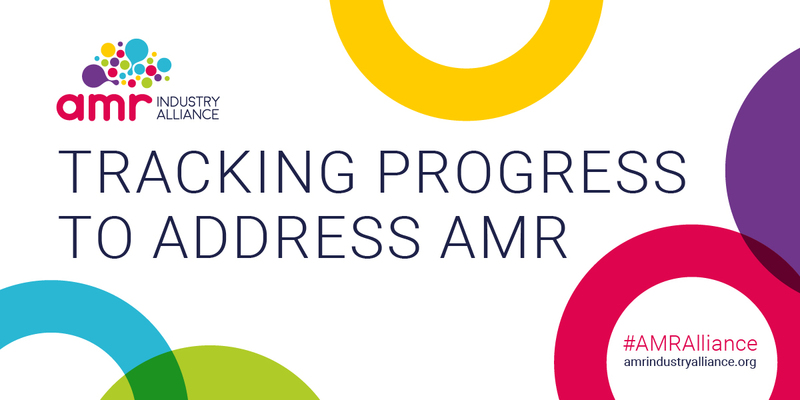 This latest progress report from the AMR Industry Alliance is encouraging and proves that our industry has taken many important steps to finding the solutions needed to combat antimicrobial resistance. As the report illustrates, biotechnology companies across the globe are investing in innovative R&D approaches – both antibiotic and non-antibiotic – and are focused on developing powerful drugs and novel tactics to fight against AMR. On behalf of BIO and our member companies, I look forward to continuing our partnership with the Alliance as we work to end this growing threat to global public health and beyond. We are encouraged by progress to date by the AMR Industry Alliance in the fight against antimicrobial resistance, as a coordinated global approach is critical in solving one of the most complex health issues of our time. We look forward to continued collaboration with our health care partners to address the significant challenges we are facing with innovative solutions, including unleashing the potential of diagnostic tests to improve appropriate use of antibiotics. Health security is an essential component of the Sustainable Development Goals (SDGs), this includes epidemics and antimicrobial resistance. There has been considerable support on the need to address preparedness and responsiveness to global health crisis, health systems strengthening, and antimicrobial resistance (AMR). If we want to accelerate the process of implementing the SDGs in these areas, we need to find ways to engage with the private sector. The AMR Industry Alliance is an important step, not least because it is a first concrete initiative that measures what is being done by the life science industry to tackle the specific challenges presented by AMR for public health. We look forward to continue to serve as a platform to allow a multistakeholder involvement for AMR. Industry’s role in addressing drug-resistant infections is critical and it is heartening to see many companies stepping-up to help tackle this global health threat. The early stages of the treatment pipeline are now benefitting from partnership and investment by industry, civil society and government. But without urgent action to also address the broken economic model for later clinical development, this progress is under threat. The report makes clear that without new incentives, biopharmaceutical companies are likely to reduce antibiotic research and development investment. Wellcome wants to see government and industry work together to develop and implement workable incentives, which must include measures to ensure new treatments are used appropriately, effectively and are available to all who need them. The AMR Industry Alliance report is a key milestone in cementing industry commitment to tackling this global challenge in a collaborative manner. In fighting AMR, the right balance should be found between facilitating access while ensuring appropriate use. This can only be achieved by multiple stakeholders working together to define the principles of appropriate use, which ensures that public health remains safe-guarded. Patients who need antibiotic medicines should be able to have access to the appropriate treatment they need to get better. Equally, medical professionals need to be able to choose from a wide range of antibiotics to provide optimal treatment for their patients. The AMR Industry Alliance, and Medicines for Europe as member, is committed to being part of this dialogue, and taking action which we hope will change the tide on AMR. Antimicrobial resistance is a developmental issue that threatens our very survival. Yet, momentum is increasing, and the progress made within one year of the UN Political Declaration is phenomenal. To respond to the challenges of AMR, industry, governments and other relevant stakeholders must collaborate on new initiatives for the good of public health. This call to action by the AMR Industry Alliance is coming at a crucial time that could support the recommendations of the Interagency Coordination Group to the UN Secretary General. If we are to curb AMR, we must all work together. The private sector has a crucial role to play in addressing drug-resistant superbugs globally. It is encouraging to see commitment and concrete examples of progress from 36 companies —but much more needs to be done within the private sector to help address this complex challenge. We must continue to make the case for action and work across all sectors, countries and professions if we are to have any chance of success. The first AMR Industry Alliance Progress Report demonstrates the commitment of the research-based biopharmaceutical companies to bring much-needed positive momentum to curb AMR. Notwithstanding a challenging innovation environment and the current lack of economic incentives, the results of the report underline the crucial role of the private sector investments in research and development to respond to the challenges of AMR, with several antibiotics and vaccines currently in late stages of development. While the report clearly demonstrates the importance of partnerships and cross-sector collaboration, R&D biopharmaceutical companies, generics, SMEs, and diagnostics, it also highlights that much more needs to be done. To deliver sustainable solutions, ensuring cooperation with all stakeholders, including governments and international organizations, is the only viable way forward in the fight against AMR.